Below is an interesting article on Cuban agriculture by Miguel Altieri, professor of "agroecology" at UC, Berkeley. It's republished from The Conversation, a smart publishing platform that's a bit like The Daily Beast for academics. Anyway, having visited Cuba in January (sticking to Santiago, on the far eastern side of the island), the trip reminded me of how robust a food supply we have in the United States. Cuba's government didn't just limit the presence of food markets, it seems to be wrestling with how to maintain a regular food supply. Concretely, there was a definite lack of easily accessible fruits, vegetables and meat. That said their overall quality was very high. As the island opens up to new economic players, the equation may be reversed, as the article highlights. President Obama’s trip to Cuba this week accelerated the warming of U.S.-Cuban relations. Many people in both countries believe that normalizing relations will spur investment that can help Cuba develop its economy and improve life for its citizens. But in agriculture, U.S. investment could cause harm instead. For the past 35 years I have studied agroecology in most countries in Central and South America. 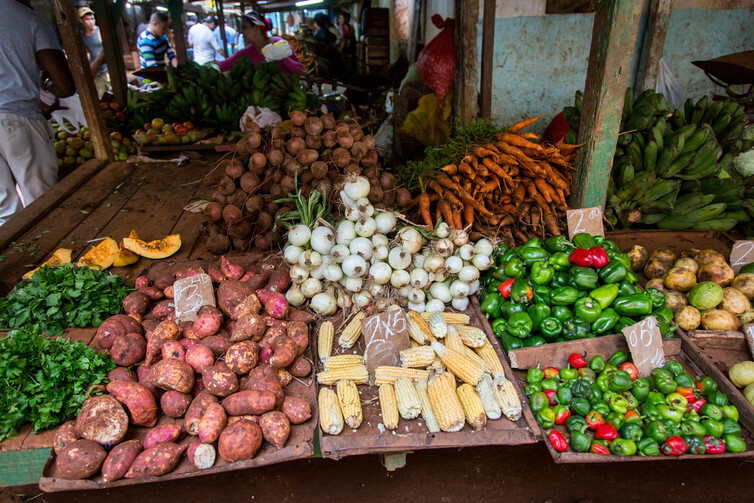 Agroecology is an approach to farming that developed in the late 1970s in Latin America as a reaction against the top-down, technology-intensive and environmentally destructive strategy that characterizes modern industrial agriculture. It encourages local production by small-scale farmers, using sustainable strategies and combining Western knowledge with traditional expertise. Cuba took this approach out of necessity when its economic partner, the Soviet bloc, dissolved in the early 1990s. As a result, Cuban farming has become a leading example of ecological agriculture. But if relations with U.S. agribusiness companies are not managed carefully, Cuba could revert to an industrial approach that relies on mechanization, transgenic crops and agrochemicals, rolling back the revolutionary gains that its campesinos have achieved. For several decades after Cuba’s 1959 revolution, socialist bloc countries accounted for nearly all of its foreign trade. The government devoted 30 percent of agricultural land to sugarcane for export, while importing 57 percent of Cuba’s food supply. Farmers relied on tractors, massive amounts of pesticide and fertilizer inputs, all supplied by Soviet bloc countries. By the 1980s agricultural pests were increasing, soil quality was degrading and yields of some key crops like rice had begun to decline. When Cuban trade with the Soviet bloc ended in the early 1990s, food production collapsed due to the loss of imported fertilizers, pesticides, tractors and petroleum. The situation was so bad that Cuba posted the worst growth in per capita food production in all of Latin America and the Caribbean. But then farmers started adopting agroecological techniques, with support from Cuban scientists. Thousands of oxen replaced tractors that could not function due to lack of petroleum and spare parts. Farmers substituted green manures for chemical fertilizers and artisanally produced biopesticides for insecticides. At the same time, Cuban policymakers adopted a range of agrarian reform and decentralization policies that encouraged forms of production where groups of farmers grow and market their produce collectively. As Cuba reoriented its agriculture to depend less on imported chemical inputs and imported equipment, food production rebounded. From 1996 though 2005, per capita food production in Cuba increased by 4.2 percent yearly during a period when production was stagnant across Latin America and the Caribbean. In the mid-2000s, the Ministry of Agriculture dismantled all “inefficient state companies” and government-owned farms, endorsed the creation of 2,600 new small urban and suburban farms, and allowed farming on some three million hectares of unused state lands. Urban gardens, which first sprang up during the economic crisis of the early 1990s, have developed into an important food source. Now Cuba’s agriculture system is under increasing pressure to deliver harvests for export and for Cuba’s burgeoning tourist markets. Part of the production is shifting away from feeding local and regional markets, and increasingly focusing on feeding tourists and producing organic tropical products for export. President Obama hopes to open the door for U.S. businesses to sell goods to Cuba. In Havana last Monday during Obama’s visit, U.S. Agriculture Secretary Tom Vilsack signed an agreement with his Cuban counterpart, Agriculture Minister Gustavo Rodriguez Rollero, to promote sharing of ideas and research. “U.S. 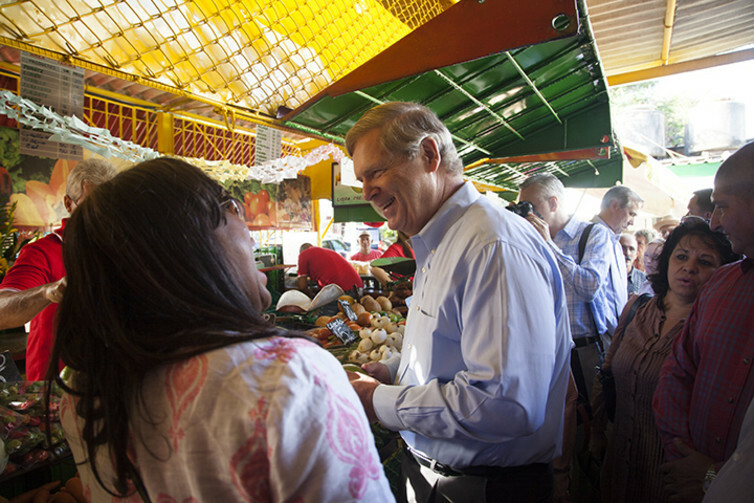 producers are eager to help meet Cuba’s need for healthy, safe, nutritious food,” Vilsack said. The U.S. Agriculture Coalition for Cuba, which was launched in 2014 to lobby for an end to the U.S.-Cuba trade embargo, includes more than 100 agricultural companies and trade groups. Analysts estimate that U.S. agricultural exports to Cuba could reach US$1.2 billion if remaining regulations are relaxed and trade barriers are lifted, a market that U.S. agribusiness wants to capture. When agribusinesses invest in developing countries, they seek economies of scale. This encourages concentration of land in the hands of a few corporations and standardization of small-scale production systems. In turn, these changes force small farmers off of their lands and lead to the abandonment of local crops and traditional farming ways. The expansion of transgenic crops and agrofuels in Brazil, Paraguay and Bolivia since the 1990s are examples of this process. If U.S. industrial agriculture expands into Cuba, there is a risk that it could destroy the complex social network of agroecological small farms that more than 300,000 campesinos have built up over the past several decades through farmer-to-farmer horizontal exchanges of knowledge. This would reduce the diversity of crops that Cuba produces and harm local economies and food security. If large businesses displace small-scale farmers, agriculture will move toward export crops, increasing the ranks of unemployed. There is nothing wrong with small farmers capturing a share of export markets, as long as it does not mean neglecting their roles as local food producers. The Cuban government thus will have to protect campesinos by not importing food products that peasants produce. Cuba still imports some of its food, including U.S. products such as poultry and soybean meal. Since agricultural sales to Cuba were legalized in 2000, U.S. agricultural exports have totaled about $5 billion. However, yearly sales have fallen from a high of $658 million in 2008 to $300 million in 2014. U.S. companies would like to regain some of the market share that they have lost to the European Union and Brazil. There is broad debate over how heavily Cuba relies on imports to feed its population: the U.S. Department of Agriculture estimates that imports make up 60 to 80 percent of Cubans' caloric intake, but other assessments are much lower. In fact, Cuba has the potential to produce enough food with agroecological methods to feed its 11 million inhabitants. Cuba has about six million hectares of fairly level land and another million gently sloping hectares that can be used for cropping. More than half of this land remains uncultivated, and the productivity of both land and labor, as well as the efficiency of resource use, in the rest of this farm area are still low. We have calculated that if all peasant farms and cooperatives adopted diversified agroecological designs, Cuba would be able to produce enough to feed its population, supply food to the tourist industry and even export some food to help generate foreign currency. We will not renounce our ideals of independence and social justice, or surrender even a single one of our principles, or concede a millimeter in the defense of our national sovereignty. We have won this sovereign right with great sacrifices and at the cost of great risks. Cuba’s small farmers control only 25 percent of the nation’s agricultural land but produce over 65 percent of the country’s food, contributing significantly to the island’s sovereignity. Their agroecological achievements represent a true legacy of Cuba’s revolution.